﻿ Long term update: How comfy is the V-Strom for pillions? Depending on who my pillion is, I take varying degrees of care with their comfort. If it’s my mate or missus then I’m not particularly fussed if they get an achy bum or their helmet knocks mine at every red light. But take someone new on the bike and it’s best behaviour all the way, with the utmost care and cultured throttle twists. So when my housemate and colleague Liam sent his 1400GTR in for a week-long stay at the garage, I begrudgingly offered up a week-long pillion service. Despite the inconvenience of having to lug him to and from work, the commute was a perfect opportunity to test pillion comfort. My main goal was to get to and from the office with no thought spared for his comfort, so I was expecting continuous head-banging and a little bit of shoving. But to my surprise our 20-minute ride was totally peaceful. Pulling out of the office and filtering between traffic was easy peasy. I upped the preload before Liam jumped on, which kept the rear from sinking every time I gassed it. The seat is well-padded and wide, which gave us plenty of space, and I kept the topbox in place so Liam could lean back and rest against it. The chunky grab rails also helped him hold on cruising down the dual carriageway. At one point I genuinely forgot he was there. “Every so often I jump on the back of a bike and straight from the start know if it’s going to be comfortable or not,” said 6ft 1in Liam. “High pegs will soon have your knees aching and a flat wooden board of a seat will give you a sore arse. 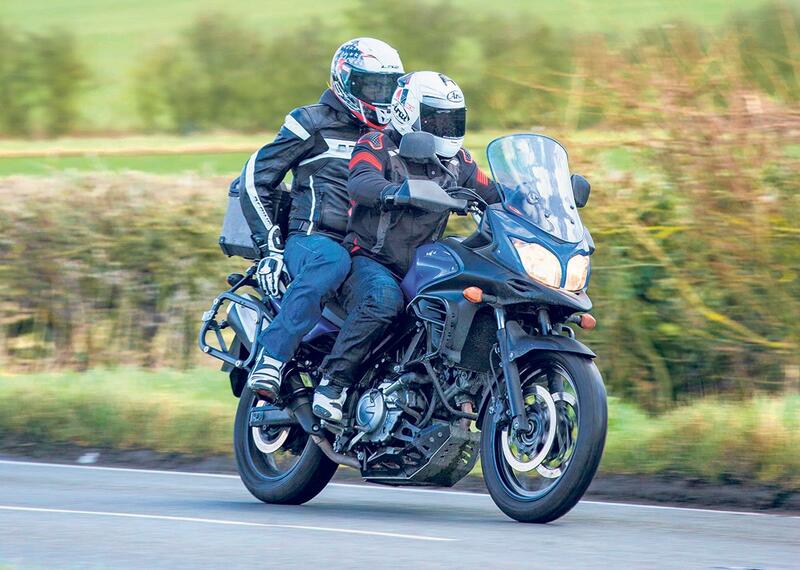 But the V-Strom has its ergonomics sorted, it’s immediately comfortable and even after a 35-minute ride my knees and bum were in good working order.” The same sentiment was shared by my 5ft 6in girlfriend after a recent 200-mile round trip. Just as important as the ergonomics is how smooth the bike rides. It can be the most comfy bike in the world, but if the throttle response is jerky and the bike rips through the gears it’ll be a nightmare for the pillion. But the V-Strom is incredibly smooth and the throttle response is composed and predictable. It won’t catch you out and the power is progressive and linear – the perfect ingredients for a pillion machine. So, after a week of riding, and even with minimal effort to make the ride comfortable the 650 performed brilliantly for the both of us, further proving what a capable motorcycle it is. I’ve been thinking about taking the V-Strom 650 XT off-road since I got the keys earlier this year.